Board Size: 32" x 21"
Display Board offers a black wet-erase surface that makes writing stand out. No smudging. Great for restaurants, hotels, legal, medical and real estate offices. 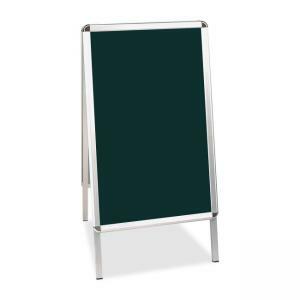 $389Ghent Enclosed Message Center - 1 / Each - 36" x 48"
$61Safco Message Board - 10" x 16"
$390Quartet Single Glass Magnetic Message Board - 1 Each - 36" x 24"
$254Quartet Four Panel Tabletop Display - 30" x 18"